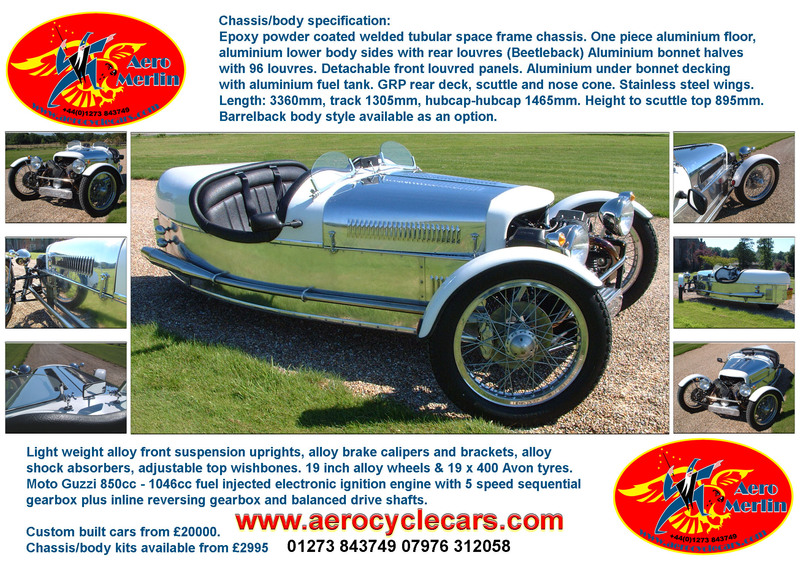 Remember...superb aluminium bodywork...with 120 louvres,... not just fibreglass! 19 inch alloy wheels, light weight alloy front suspension units & alloy brake calipers! 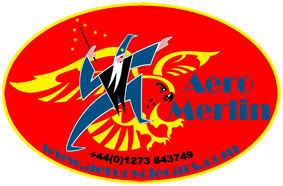 Aero MG3 kits and full build prices and specifications. Our cars are subject to engineering refinements and on-going development. We therefore reserve the right to change specifications and prices accordingly. This is particularly critical with out sourced components as we are a low volume consumer, and subject to our suppliers increasing their prices. All kits and fully built up cars reflect UK MSVA regulations only. All new wheels, new tyres and new brake hoses are DOT marked. 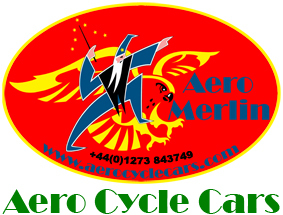 Aero Cycle Cars cannot supply items to specifically meet standards outside UK MSVA requirements. It is to be assumed therefore, by any overseas client, that components supplied may have to be modified to suit local national requirements. Deluxe louvres included in specified panels. Fully welded space-frame chassis, blasted and epoxy powder coated in black. All aluminium components fully cut to fit with all holes punched. Upper rear aluminium bulkhead panel with pair of fitted hinged luggage locker doors. Aluminium panel fitted to front of scuttle (visible when bonnet halves are raised). One piece aluminium floor panel. All riv nuts fitted to the chassis enabling fitment of removable panels. Pre-formed aluminium bonnet sides complete with 48 louvres per side. 2 louvred detachable, shaped front side panels. GRP (fibreglass) nose cone, scuttle, rear cover. Grp rear cover fitted with aluminium trim. 3 tubes of body adhesive. N.B. For the avoidance of doubt, the circle polished dashboard is not included in this kit, as it has always been an option, and is shown within the options list below, or within the MG3 Modular Kit 006 Dashboard and Scuttle Kit. All panels will have trial fitted to the chassis leaving you simply to rivet them into place. Gear change linkage: £175 Please submit your splined gear changer for us to weld to a component. This is found on the end of your donor gearbox. c) brand new engine/gearbox/final drive. All of these options are at additional cost and subject to availability. Full build prices: Scroll right down to the bottom of this section. Alternatively, and to make things easier if you are initially cost conscious, you may purchase Kit 001 as a starter kit, then buy items 2-8 (as shown below), then from the options list as you require them. This gets you underway with your build. Fully welded chassis, blasted and epoxy powder coated in black. All aluminium components fully trimmed to fit with all holes punched. Polished aluminium panel fitted to front of scuttle (visible when bonnet halves are raised). GRP (fibreglass) nose cone, scuttle, rear cover. Pair of black epoxy powder coated upper wishbones complete with fitted bushes. Pair of black epoxy powder coated lower wishbones complete with fitted bushes. Pair of light weight alloy uprights, caliper brackets and removable drop forged steering arms. Pair of machined steel stub axles. Pair of inner and outer wheel bearings (races pressed into hubs)/seals. Pair of top and bottom suspension ball joints. Pair of adjustable shock absorbers complete with powder coated 250lb springs. Pair of splined wire wheels (silver powder coated), fitted with Avon SM2 19 x 4.00 tyres. Pair of chrome on brass hexagonal threaded hub caps. 2 light weight alloy four piston calipers complete with brake pads, 260mm diameter x 10mm discs including fixing bolts . Steering rack complete with track rod ends (RHD). Pair of alloy steering rack mounting clamps. Upper steering column complete with steering lock and wiring loom connector. Lower steering column complete with two universal joints. Pedal box assembly complete with tandem brake master cylinder and brake light switch. Standard wiring loom (carburettor engines). Injection engines will require the separate engine loom from your donor bike, and you will need to connect this in to the standard loom. Includes fuse box and relay box. Reversing gear box plus fitting brackets and fully balanced precision made two section fully balanced propshaft complete with self aligning rear pillar block bearing. Pair of Vinyl covered bucket seats including aluminium mounting plinths. It is assumed that you are providing a suitable donor Moto Guzzi bike. Please note that this kit option does not include a drivetrain (engine/gearbox/final drive), it enables you to build a fully rolling chassis (using your donor bike rear wheel) ready to receive your donor engine, gearbox, final drive and all engine ancillaries. Mirror, internal. UK MSVA compliant. Bucket Seats (black vinyl) complete with aluminium hinging mounting plates. Please note, for LHD (left hand drive) cars, there is an additional surcharge to cover the costs of a different steering rack, changed pedal box and pedals, different brake line fittings, different dashboard, and changed fuel tank. See itemised component list below this specification. Mig welded space frame chassis complete with all brackets, reversing gearbox platform, seat belt mountings, pedal box assembly and pedals, TIG welded upper and lower wishbones. All powder coated in gloss black. Light weight aluminium alloy forged uprights, with bolt on stub axles. Light weight alloy adjustable dampers, 200lb black powder coated springs. Silver anodised alloy calipers fitted with pads, 6mm 280mm diameter discs, alloy caliper bracket. Stainless steel flexible brake hoses throughout. 19 inch Akront/Morad alloy 40 spoked rims with integrated alloy hubs, shod with Avon SM2 4.00 x 19 tyres. Standard powder coated Moto Guzzi 18 inch rear wheel (spoke types might vary) fitted with 110/90 H 18 tyre. Moto Guzzi 850/950 round barrelled engine from late 1970s to 1984 vintage. The engine/gearbox combinations with vapour blasted crank cases are totally rebuilt/reconditioned by our specialist Motori di Marino. Carburetion is by standard Dellorto carburettors. In the case of Le Mans spec engines (higher output), Le Mans spec carbs are supplied. Later fuel injected engines can be supplied and fitted at extra cost. Reversing gearbox fitted within the tunnel. Propshafts are fitted front and rear of the reversing gearbox. Standard Moto Guzzi drive box/bevel box commensurate with the age of the engine/gearbox combination, reconditioned by Motori di Marino. Stainless steel fuel tank mounted under the bonnet, fitted with plated Monza filler cap. Electronic fuel pump. Stainless steel header pipes, intermediate pipes, and silencers. Standard Moto Guzzi early T3 type black powder coated swing arm, fitted with new bearings and oil seals. Note: Later type swing arms can be fitted up to and including California Stone/California Special Sport type, however, the internal drive shaft differs. Twin adjustable Hagon shock absorbers fitted with 200lb springs. New Brembo rear caliper with pads. Stainless steel brake hoses. Either used/reconditioned Moto Guzzi handbrake calliper, or combined Hi-Spec rear brake/handbrake caliper fitted to special alloy bracket. New handbrake cable back to handbrake lever located on the tunnel. Seven inch vintage plated headlight bowls with integrated side lights. Torpedo indicators fitted to mudguards. Stop lights and indicators fitted to pods on aluminium sides. Single tail light/number plate light fitted to aluminium number plate, attached to rear of chassis. Combined stop/tail/indicators/number plate lights fitted to aluminium lighting board attached to rear of chassis. Both Beetleback and Barrelback cars have fitted rear fog lights and a reversing light when a reversing gearbox is fitted to the car. Either 17mm solid elm dashboard (flat top scuttle only), or 3mm aluminium polished or engine turned dashboard. Fibreglass (GRP) scuttle in either standard or Aero (raised/humped) type. Standard 80mm diameter Moto Guzzi Speedometer and Rev Counter. Five warning lights, two switches, illuminated indicator switch, multi lighting switch, hazard warning switch, illuminated fog light switch, horn button. 12 or 13 inch Mountney wheel, fitted to boss and aluminium turned boss spacer, attached to two piece collapsible steering column with steering lock, connected to steering rack mounted by alloy brackets. Pair of vinyl upholstered bucket seats. Side carpets, and floor carpets. Standard three point seat belts. Nose cone, scuttle, rear cover re fibreglass (GRP). Side panels, top decking, bonnet halves, bulkheads, and tunnel covers are aluminium. One piece 2.5mm aluminium checkerplate floor. MSVA approved fold back wing mirrors. Scuttle mounted rear view mirror. Pair of Brooklands aero screens. Our policy is one of continuous development, therefore, specifications might change from time to time, and extra facilities added. You will be fully informed during your build. We can paint the GRP components only, leaving polished bodywork, or paint the whole car. Allow £1200 to fully paint a car. 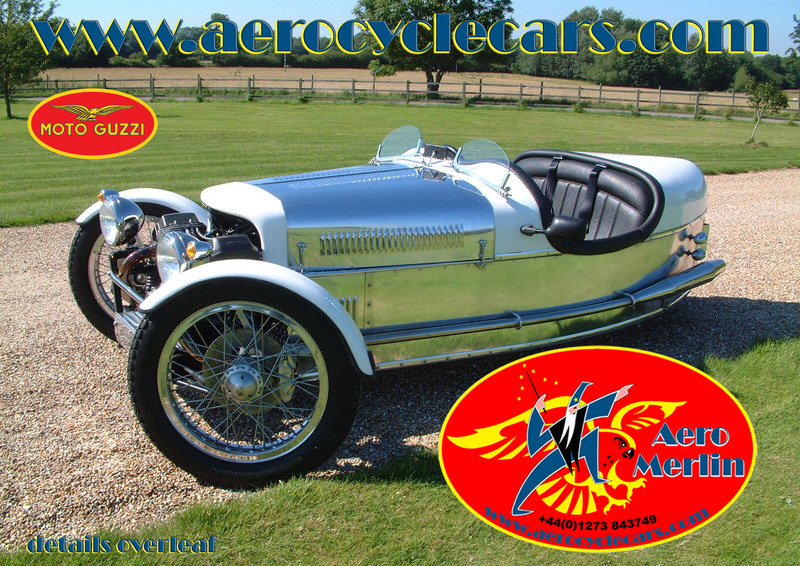 A fully built up Moto Guzzi car is supplied with fitted aeroscreens. Remember, we supply and use new components only (excepting our refurbished/rebuilt engines/drivetrains), nothing is used. Our built up prices do not include the costs of an MSVA test, an MOT test and full registration. These published charges are passed on to you at cost. We present the car for MSVA & MOT tests at cost. We cannot control the dates of either tests or registration procedures in relation to a build. MSVA Test £104, MOT test, £40, first registration fee, £55, VED (road tax for 1 year) £82. The nearest MSVA test centre is a 200 mile round trip (Southampton), and the test lasts for 4 hours. A presentation fee for both tests (including fuel), is charged for at a cost of £250. We cannot guarantee the year/age related registration that DVLA will allocate. We endeavour to work with DVLA in obtaining an age related registration number, or a new number, generally, however the final registration number is down to DVLA's discretion and guidelines. For MG3 cars using brand new components throughout, and/or one fully reconditioned unit (engine/gearbox), we can obtain a new registration should you wish, or, an age related registration number. We reserve the right to increase prices even once quoted, should our suppliers do likewise. Whilst we hope to maintain our prices once quoted, fluctuating prices from suppliers may well cause a moderate increase.